Among the trickiest environments to navigate for people with mobility issues is the bathroom. Yet, the use of assistive bathroom aids can help reduce risk factors and falls, as well as make a home bathroom more comfortable to use. How do you transform your bathroom into a safer place to go about your daily care activities? 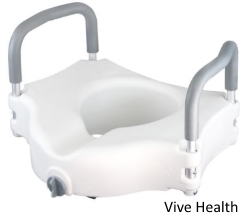 Medical products expert Joe Fleming of Vive Health advises beginning with installing a raised toilet seat. What exactly does a raised toilet seat or toilet seat riser do? Whether you have ongoing mobility issues, temporary arthritis pain, or are recovering from a surgery or injury, a raised seat for your toilet could benefit you. Talk with your healthcare provider for recommendations, based on your needs. It is worth checking with your insurance company to see if a toilet seat riser qualifies as “durable medical equipment” and may be covered by your policy with a doctor’s order. Fortunately, raised seats for toilets are not just available from medical supply companies. 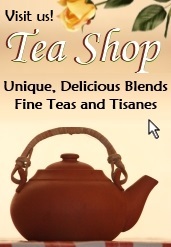 They have made their way into the widespread consumer market and can be found online or even at your local pharmacy. Some raised seats come with handles you can add or remove, which is beneficial for people who already have grab bars installed in their bathroom. And because toilet seat risers take up vertical space, they don’t impede floor space for navigating the bathroom. Depending on the toilet seat you purchase, installation is typically quick and does not require special assistance or tools. Check on weight limits for the toilet riser you are considering. Some seat materials and construction may hold more weight than others. Additional features may be a factor in the raised seat you choose. Some may feature an ergonomic design to make sitting more comfortable. 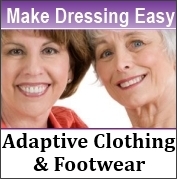 Others may have padded or wide-grip handles, which may be especially helpful for people with arthritis. Along with a raised seat for your toilet, using grab bars, shower chairs, and other bathroom aids will help prevent falls and promote safety. 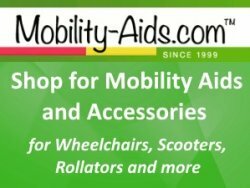 To learn about other assistive devices for your bathroom, click here: Mobility Toilet Aids.